Problems with playing videos on the freerunner? - The kernel is now (July 2010) configured to use kernel-mode switching (kms) for glamo. The glamo video driver has no direct control over glamo anymore and cannot use accelerated video playing until a new driver is written. 1.1.5 Another derivated method : works like a charm for me ! It plays mpeg-4 640x240 with 24fps stretched fullscreen, however other formats will require transcoding. 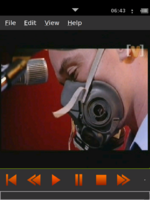 The default media player doesn't seem to handle video very well, but mplayer does OK. This only applies to GTA02 hardware which uses Glamo graphical chip. First of all you'll need special version of Mplayer with glamo support. Please refer to: http://unadventure.wordpress.com/2008/06/08/accelerating-in-my-pocket/ for more details. Now, you can toggle the fullscreen by tapping the screen and exit from mplayer by touble-tapping the LCD. Accelerometers or hardware buttons could help more. The output isn't in a proper window, so background stuff sometimes flickers through. When done on the local terminal the keyboard is obscured so you can't exit. SSH works quite well. The gamma/brightness/contrast is weird. Encoding adjustments into the media is a workaround. Vertical banding (as seen in landscape position) is quite noticeable. Using CTRL-C to exit vidplay doesn't reset the screen; use 'q' instead. Despite these issues, it proves that the horsepower is there and it can be done. Another derivated method : works like a charm for me ! No ssh, no xrandr, no script needed, juste mplayer and qwerty keyboard : Like it's said in the "Getting started with FreeRunner" wiki page, you have to install the full qwerty keyboard, see these instructions. After that, you can go to Terminal and type : mplayer vid/my_video.avi Mplayer starts in full screen, if your video is optimized like below 240x320 it's work like a charm and to quit just use the power button. Test the video filter settings (-vf crop=...) often omitting the last "rotate=2" (Optional, but recommended for long videos). Video is problematic on Neo 1973. The CPU is certainly not fast enough to decode 480*640 video. The display is portrait, which means that an additional rotation step is needed for most landscape video, adding to CPU usage. Downloading an arbitrary video, and playing it without transcoding it, then playing it later will not be possible. The LCD can be switched to a 240*320 stretch mode, which is much less taxing. Re-encoding video to rotate it, and scale to 320*240, and encoding with a low CPU use codec such as MPEG-1 may well make half-screen doubled videos playable at 25fps. If not, then it almost certainly will be possible at 12fps. where 'X' is your terminal number - for example if you did chvt 4 then /dev/tty4 is your terminal. From a conversation with XorA, in the IRC channel. 400kbps mpeg4 works on a 200Mhz neo (without sound) on prerotated 240*320 ffmpeg codec videos, at 25fps, using stock mplayer. With sound, this drops to 18fps. There are optimisations for mplayer that look promising to get 25fps with sound. This will rotate the video/DVD, scale it and encode it to mpeg4 with a bitrate of 300kBit/s. As a nice GUI gnome-mplayer can be recommended. The popular command line video player. It provides another GUI to mplayer. This page was last modified on 23 May 2011, at 09:14. This page has been accessed 84,297 times.